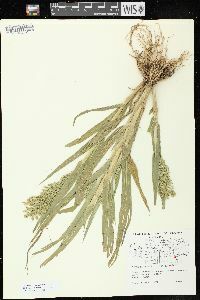 Annual herb, tufted 20 cm - 1.2 m tall Leaves: numerous, alternate, two-ranked. Sheaths round in cross-section, densely soft-hairy with deciduous, bumpy-based hairs. Ligules membranous, fringed with hairs (hairs 1 - 3 mm long). Blades 15 - 40 cm long, 0.5 - 2.5 cm wide, parallel-veined. 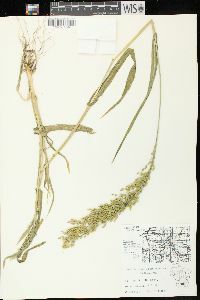 Inflorescence: a relatively contracted, branched arrangement of spikelets (panicle), usually nodding, 6 - 20 cm long, 4 - 11 cm wide, over twice as long as wide, with stiff, appressed to ascending branches. 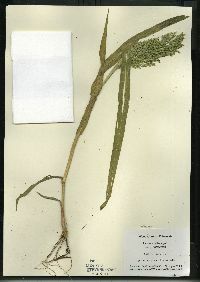 Fruit: a caryopsis, indehiscent, enclosed within the persistent lemma and palea. 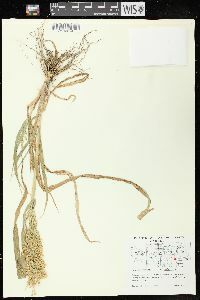 Culm: stout, 20 cm - 1.2 m long, round in cross-section, internodes often with bumpy-based hairs. Nodes minutely hairy. 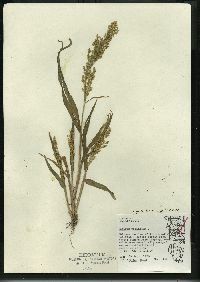 Spikelets: solitary, found in the upper portion of the inflorescence, 4 - 6 mm long, egg-shaped. 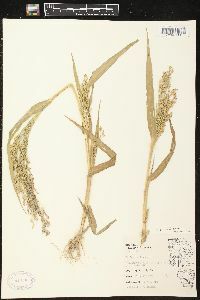 Glumes: unequal, herbaceous. 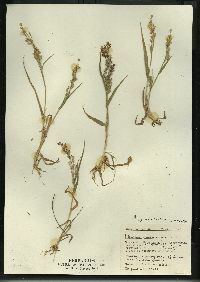 Lower glumes 3 - 3.5 mm long, one-half to three fourths as long as spikelets, gradually tapering to a slender point, five- to seven-veined, veins minutely rough towards the apex. 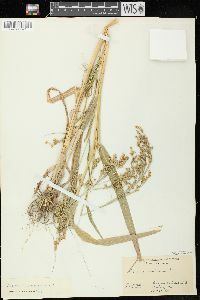 Upper glumes 4 - 5 mm long, slightly longer than upper florets, eleven- to fifteen-veined, veins minutely rough towards the apex. Lemmas:: Lower lemmas similar to upper glumes, 4 - 5 mm long, slightly longer than upper florets, nine- to thirteen-veined, veins minutely rough towards the apex. Upper lemmas shiny, with rolled-up margins on the upper surface. Paleas:: Lower paleas 1 - 1.5 mm long, up to half as long as the upper florets, transparent. Upper paleas longitudinally lined. Florets:: Lower florets sterile. Upper florets bisexual, straw-colored to orange, 3 - 4 mm long, 2 - 2.5 mm wide, pointed at the apex, more or less shiny. Anthers three. Stigmas red. 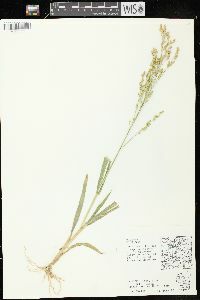 Habitat and ecology: Introduced from Asia and cultivated as a forage crop. It occasionally escapes into disturbed ground. 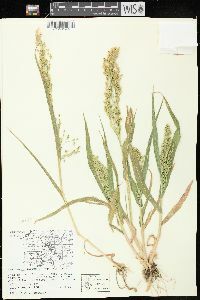 Etymology: Panicum comes from the Latin word panis, meaning bread, or panus, meaning "ear of millet." 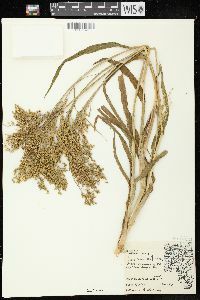 Miliaceum means millet.